Texture and color deserve discussion on two levels: biological plausibility, and level of execution. The skin texture is wrinkled, with a few scattered warts or tubercles. The tail is crowned with a line of low spines, as previously discussed here. 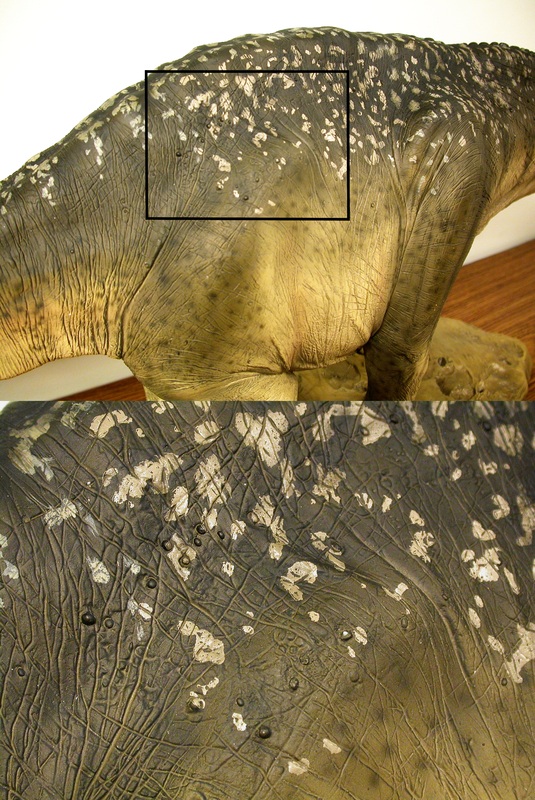 We know from skin impressions that sauropods had naked skin, with non-overlapping, generally hexagonal scales ranging from 1-4 cm in diameter (Czerkas 1994, Platt and Hasiotis 2006). Would the individual scales be visible at the scale of this sculpture? The maquette is 1.1 meters long in a straight line from the right side of the mouth to the tip of the tail, and I measure it as 1.27 meters along the dorsal body margin. Most mounted apatosaurs are in the neighborhood of 70 feet long (21 meters), and the monster at the OMNH is 92 feet (28 meters). The maquette is therefore between 1/16 and 1/22 scale, depending on how big an animal it is supposed to represent (I almost wrote, “assuming it is an adult”, but most mounted sauropods are demonstrably subadult; even the monster apatosaur from Oklahoma has some elements unfused). An unusual but not unheard-of scale for dinosaur figures is 1/18, so that may have been the goal here, for a “in life” length of 75.5 feet (23 meters). Back to the epidermal, as opposed to proportional, scales. A 4-cm scale on a real Apatosaurus would be about 2 mm on the maquette, and the more common 1-cm scales would be about 0.5 mm. Those would be pretty darned difficult to sculpt and cast in any way would that make them recognizable, so I think we can safely overlook the absence of visible scales on the maquette (warts excepted). Would scaly skin bunch and fold like the skin on the maquette? Beats me. From my experiences with turtles, some of which are pretty darned wrinkly, I wouldn’t rule it out. So I judge the texture plausible. And the level of detail in the execution is phenomenal. I said in the head post that the level of detail you see there is perpetuated through the entire sculpt, and I stand by that. The maquette invites–and withstands–close scrutiny. The color of the maquette is interesting without being vibrant: olive green above, shading into a tannish-yellow below, with stripes on the tail and faint dark freckles on the neck, body, and limbs. The freckles remind me of the scattered dark spots sometimes seen on the skin of elephants, so that may be a deliberate homage. Finally, the dorsal surfaces of the neck, body, and proximal tail are mottled with off-white or grayish splotches that recall the spotting on some deer. 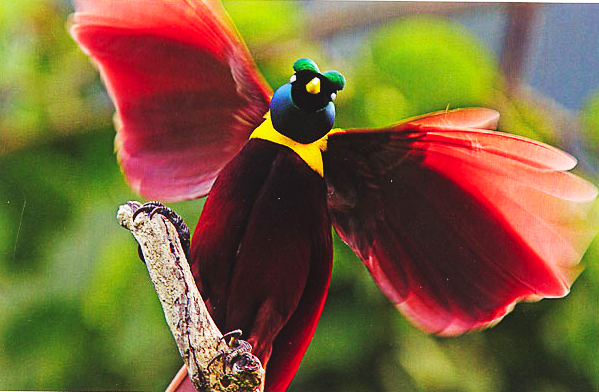 Now, I am typically an ardent proponent of flamboyant dinosaurs (see here and here). 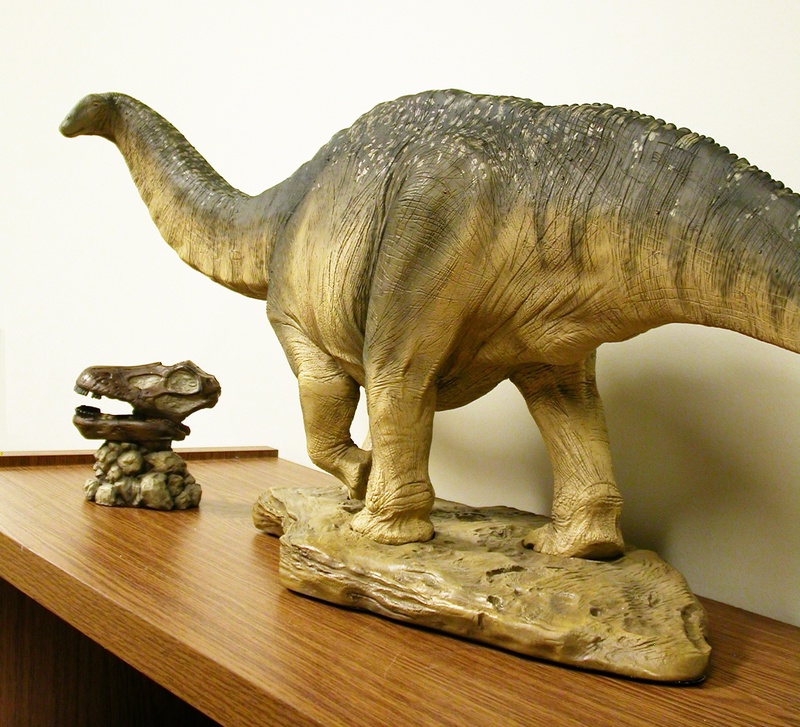 If someone had asked me to design an Apatosaurus maquette, I would have done things differently. I would have slapped on the spines and dewlaps and inflatable display sacs until this thing looked like the three-way love child of Todd Marshall’s Spinosaurus, a bird-of-paradise, and the 80s hair metal band of your choice. That’s what I would have done, if someone asked me to design an Apatosaurus maquette. But now that I see the one that was actually produced, I would change almost nothing. Because the underlying anatomy would get lost, and the thing would become just a billboard for all the flamboyant gloop (just like some real animals). And because not every animal is a head-to-toe wack job; for every Golden Pheasant there are roughly a thousand little brown passerines. So the color is good. Great, even. It’s really hard to convey how lifelike this thing looks, as if at any moment it might just stroll right off the end of my bookcase. Heck, I’ve seen lots of real animals that looked less alive that this maquette (some lizards, many amphibians). That the overall design and level of detail can inspire that reaction in anyone is a big win. That it can make me feel that way, when I should be maximally on guard against any mistakes, is even better. But now I’m starting to break the bounds of objectivity, so I’ll stop here. I’ll provide a final objective verdict, and also give my subjective impressions, in the next, and final, post. Czerkas, S. 1994. The history and interpretation of sauropod skin impressions. GAIA 10: 173-182. Platt, B.F., and Hasiotis, S.T. 2006. Newly discovered sauropod dinosaur tracks with skin and foot-pad impressions from the Upper Jurassic Morrison Formation, Bighorn Basin, Wyoming. Palaios 21: 249-261. The subject is intended to be an adult—”herd matriarch” even—according to the “backstory” section. you know what’s gonna come when I “Hm..” I guess: who says they are subadults? We see in the way they ossify (rather: do not ossify) their limb cartilage that even fairly adult sauropods have some features that look like juvenile birds and alligators. Maybe reduced ossification and thus fusion was simply a sauropod feature. A neoteny? ech: The subject is intended to be an adult—”herd matriarch” even—according to the “backstory” section. Yep, you’re right, I should have mentioned that. There’s a statement from the sculptor, Jorge Blanco, in this post on the Dinosaur Toy Blog, in which he says, “In this case I decided to represent a healthy, young individual. Maybe in the mating season.” So the official backstory conflicts somewhat with the artist’s stated intention. Not that it makes any difference–I think the maquette is equally plausible either way. Heinrich: I guess: who says they are subadults? We see in the way they ossify (rather: do not ossify) their limb cartilage that even fairly adult sauropods have some features that look like juvenile birds and alligators. Maybe reduced ossification and thus fusion was simply a sauropod feature. A neoteny? Well, in this case, it’s unfused neurocentral sutures in a dorsal vertebra, and an unfused cervical rib. Since these are things that fuse eventually in all other known sauropods, in this case I am pretty confident that the animal was not fully mature. :-) Sorry I didn’t make that clear in the post. Oh, and these elements are all 30-40% larger than their counterparts in the mounted Carnegie A. lousiae, so 92 feet is probably on the conservative side. I’ve had a manuscript on this back-burnered for ages now; probably time to dust it off and get it moving again. thanks for the details, Matt. And the size has me thinking development plasticity again. Yeah, I have a hard time squaring some of what I’ve seen in Morrison sauropods with Martin’s finding–or inference–that most sauropods he’s sampled have fairly determinate growth and all max out at the same size. The giant Oklahoma apatosaur and the small adult-looking sauropods from the northern Morrison would seem to blow that. Unless they’re distinct species, and body size at maturity is phylogenetically informative after all. well, how many samples does Martin have of animals that are one species for sure? AFAIK, not that many. Which museum wants its prime skeletons drilled anyways? And what is true for one species need not be true for another….. If we assume that sauropods had fairly comparable growth for a long time (from egg to, say, 50% of max size), and started spreading only after that point (an entirely new hypothesis, I admit) it would take a lot of sampling to find proof. So what we (I think) know for sure is that they had determinate growth, and grew like hell right from hatching to huge size – but the upper end of the curves, how large exactly they got, that’s much less certain. Yep, that squares with what I’ve seen. As usual, it’s a problem of sample size. But…they’re sauropods. Whatcha gonna do? A few years back the AMNH had a special (temporary) exhibition (it may have been the one on Darwin’s Beagle voyage) that featured a live, two-foot-plus long, green iguana: I had to watch it closely (from a distance of 18 inches or so) for an extended period of time to convince myself that it was really alive and not a stuffed specimen! They’ve got to breathe, but you didn’t see the rib-cage expand and contract the way you would with a similarly sized mammal. Not off-topic at all! That’s why my reptilian pets have always been turtles. IME, they rarely just sit motionless for hours on end unless they’re actually sleeping. In which case I know they’re not going to do anything, so I can stop watching. Thanks for the kind words on the post series. I’ve had a lot of fun writing them, and they’ve given me the opportunity to talk about some stuff that’s been on my mind for ages. I’m glad other people are finding them useful as well. If the Oklahoma Apatosaurus isn’t fully mature at 92 feet…. how big could it have really gotten? A 92 foot apatosaur must have weighed 40+ tons! Yeah, exactly! Fun to ponder. Note to Allen Hazen: The Beagle voyage exhibition was at the NHM in London from late 2008 to early 2009, and I looked after the two animals in it; a green iguana fed some lettuce and fruit every day and a massive, ornate horned frog fed a mouse every 10 days or so. Both were incredibly still most of the time. I never heard of the giant OMNH Apatosaurus. Which collection number has it and which spieces it is?